That famous quote is a "very free translation" from Johann Wolfgang von Goethe's "Prelude at the Theatre," from "Faust," according to the Goethe Society of North America, goethesociety.org. I love it because it's a kind of mantra for lifelong learners of all ages who go after what they want. They simply begin taking steps toward it and keep going until they get there. This is an important aspect of continuing education. It's easy, especially for busy adults, to put aside personal development, whether that development means finishing a college degree or finding inspiration on a learning vacation. If you could use a little help getting your positive thinking mojo back, check out our collection of articles focused on helping you find the motivation you need. This simple concept is extremely powerful. It's all about the secret power of the mind. Do you know how to create the life you want? It's really not a secret after all. The power is available to every single person, including you. And it's free. You are what you think. It's easy to get stuck in a routine. We graduate from school, get married, raise a family, and somewhere in there, we get so busy living a life that happened accidentally, we forget that we can create the life we want. No matter what age you are, you have the power to change your life. We've got eight motivations to create the life you want. Start today. It's really not that hard. Personal development is often one of the first things to get marked off the priority list when life gets hectic. It happens to everyone. Give your personal goals and objectives a fighting chance by writing them down. Make them SMART goals and objectives, and you'll have a much better chance of attaining them. A goal is so much easier to reach when you have a plan, a personal development plan. Whether your goal is related to being a better employee, getting a raise or promotion, or is just for you as a person, this plan will help you succeed. Begin with the end in mind is one of Stephen Covey's seven habits of highly effective people. 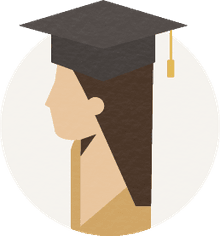 For non-traditional students, starting the year with graduation in mind can be a good way to get over the jitters of going back to school. Success is not a lucky accident. Successful people see the world differently than less successful people, and they know they have the freedom to choose . It isn't just about positive thinking, although that's a big part of it. Success has to do with understanding how your brain works, and how it is affected by chemical changes caused by thoughts and emotions--chemical changes you have control over. It is your brain after all. A learning contract is a document a student creates to compare current abilities with desired abilities, and determine the best strategy for bridging the gap. What do you need to know that you don't already know? The learning contract includes learning objectives, available resources, obstacles and solutions, deadlines, and measurements. You've thought about going back to school for a long time, yearned to finish your degree or earn your certificate. How do you know you'll succeed? Follow our 10 secrets to success as an adult student and you'll have a great chance. They're based on Dr. Wayne Dyer's "10 Secrets to Success and Inner Peace." You can get closer to thinking positively by reducing the stress in your life. At least one of our 10 ways to relieve stress will be a good fit for you. If not, write your stress away in a haiku. There's an invitation at the end of the article. Can't wait to see yours!